Do You Have to Worry About Capital Gains Tax? When you start digging into the tax code – not something we’d recommend unless you are suffering from severe insomnia – you’ll quickly notice that there are a seemingly endless number of taxes. Fortunately, many of these taxes are highly specialized and don’t affect most people. However, some of these taxes occasionally pop up in media stories, which can lead to confusion. You have probably heard of the capital gains tax somewhere, but if you don’t know what it is or if it will affect you, you’re not alone. 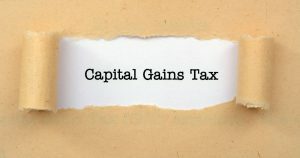 In this article, we’ll provide a quick review of the capital gains tax and explain why it’s something you probably don’t have to worry about. Simply put, a capital gain, is the positive difference between the purchase price of an asset and its selling price. So, for example, let’s say that you purchased a piece of art by an unknown artist for $100. Over the next five years, the artist shot to fame, and the little portrait hanging over your mantel is now worth $10,000. Good job! If you sell the artwork, your capital gain will be $9,900. You can earn capital gains on almost anything, but the most common items are the sale of property (like your home), a business, stocks and mutual funds, and collectibles. It should be noted that if you lose money, that is considered a loss, not a capital gain. It shouldn’t surprise you that the IRS isn’t about to let you pocket all that sweet profit without taking its cut, which leads us to the capital gains tax. The government has a special tax that it places on all capital gains. It is creatively called the capital gains tax. Now, before you begin freaking out about selling your house in the near future, there are two reasons that you really shouldn’t worry about the capital gains tax. The first reason is that the capital gains tax rate is actually lower than the income tax rate. For example, the highest amount of capital gains tax that you can possibly pay is 28%, while the highest income tax rate is 39.6%. The amount of capital gains tax you will pay depends on what type of asset you are selling and your income. The lower your income, the lower the rate of capital gains tax you will have to pay. In fact, if you pay 15% income tax or less, you don’t have to pay any capital gains tax at all on most assets, including real estate and most kinds of stocks. The second reason you shouldn’t worry about capital gains tax is that 99% of homeowners don’t have to pay it when they sell their homes. Many Americans only encounter a capital gain when they sell their home. Setting aside the housing bubble crisis, home prices tend to rise over time, which means that if you’ve lived in your house for several years, chances are you can sell it for a profit and recognize a capital gain. Fortunately, there is a very sweet exemption in the capital gains tax law. If you are selling your primary residence, then you can enjoy a capital gains exemption of $250,000 as an individual or $500,000 as a couple. That means as long as you don’t earn a profit of over $250,000 / $500,000, you won’t have to pay any taxes on your capital gains. As if that weren’t nice enough, you can often deduct money you spent on improving or fixing the home from your capital gains calculation. Of course, there are some caveats. In order to receive the capital gains tax exemption, you must have lived in your home for at least two of the last five years before you sell. Also, as mentioned, this must be your primary residence. If you sell your vacation home or rental property at a profit, then you’ll have to pay a capital gains tax. When Should You Worry About Capital Gains? There are a few instances when you may need to pay capital gains taxes. As we just saw, you’ll have to pay capital gains taxes on profit you earn by selling any property that is not your primary residence. If you are a business owner, you may get hit with capital gains on your business sale. Stocks within a retirement account are usually safe from the capital gain tax, but earnings on stocks and mutual funds within your normal investment portfolio will likely get hit with capital gains taxes when you sell them. Want to learn more about taxes? Take a look at our taxes article archive or increase your financial IQ by starting a Money Club. How do you determine what is your rate of Capital Gain Tax . My husband died in 2016 and I moved to Arizona in August 2017 to be near my daughter. I owned a townhouse and it had been rented for several years but in order to have money to purchase a place in Arizona, I had to sell the townhouse. Provisions were made in my husband trust for me to live in the residence where he and I lived but had stipulations that I could not remarry or co-habitate with another man. Also, if I was gone from this residence for more than 6 months, it would revert to his son who lived right next door. I made the decision to move to Arizona to be near my daughter and her family because of my age (79) and health reasons. This townhouse I sold was never in my husbands name. I owned it at the time we married in 2004.. He enjoyed the rent money this house generated for all those years just as I did. It was a supplement to our income. I tell you all this because it just seems unfair when this townhome was the only home I had ever owned and now I don’t have the exclusion rights from Capital Gains Tax. If you can give me any advice, it would be really appreciated. In order to claim the $250,000 capital gains exclusion, the home must have been your principal residence for 2 of the 5 years prior to sale. If I have a capital gain on sale of a home in which I lived two of the last five years, does this amount get added to my annual income that determines which capital gains tax bracket I fall into? Is the total amount added in, or just the part that is not exempt from capital gains tax? You can exclude up to $250,000 of gain on the sale of a home that you owned and occupied for two of the five years prior to sale. If the gain exceeds that, the excess is included as capital gains on your tax return. Your rate of capital gains tax depends on your total income shown on your tax return — for most people capital gains are taxed at 15%, but if your income is considerable, your tax rate could be higher. Your husband’s half of the home received a stepped up basis to the value on the date of his death. If you live in a community property state and the home was held as community property, then your half would also receive a stepped up basis. And you can exclude up to $250,000 of gain on the sale of the residence. So it is likely you won’t owe much at all in taxes. My husband of 38 years died two months after moving into a new home that we had built. I think I can sell the home for 100k more than we paid. It has been 16 months since we closed and moved into the home. Am I exempt from the capital gains tax that I would normally have to pay when selling less than the two years required to live in residence..? I live in Texas and plan to downsize when I move. I’m so sorry for your loss. The tax basis for his half of the property is the value at the date of his death. And if you are in a community property state, your half may also have that increased tax basis. In addition you may be able to prorate the $250,000 exclusion under an exception to the 2-year rule because of unforeseen circumstances. I currently have no income and live with my husband on his pension which is low enough to have no tax liability. A couple of years ago I bought (using my savings and borrowing some cash against my credit card) a rundown house, fixed it, and recently sold for profit. Now, with his pension added, our combined income is taxable. Can we file married but separate so that I report capital gain and he reports his pension only? I tried the math, and it proves the lowest taxes for us. Thank you.